Second, we know that The Flu vaccine is not 100% effective, but it still protects you and your family. Generally its 40-60% effective, depending on how well matched the circulating strains are to the vaccine. Vaccine makers have to predict one year in advance which circulating strain will be causing trouble. In 2014-2015 flu season, the strains were not well matched, so the vaccine was only 25% effective. (However, if you had a 25% chance of winning the lottery, I bet that you would give it a go). During the 2015-2016 flu season, the vaccine was 47% effective. Also, if you get the flu and you have been vaccinated, it will shorten the duration of symptoms, from 10 days to 2-4 days, lessen the severity of symptoms, and helps prevent hospitalization. Moreover, if you do not get the flu vaccine and you come in contact with the virus, you many not get symptoms but you will carry the virus in your nose. Carriers can spread the flu even if they do not get symptoms. Getting the vaccine, eliminates the carrier state which becomes especially important for parents and caregivers of children less then 6months old who are not eligible to get the flu shot. Kids under 2years old have the highest risk for hospitalization and complications from the flu, such as ear infections, pneumonia, and death. 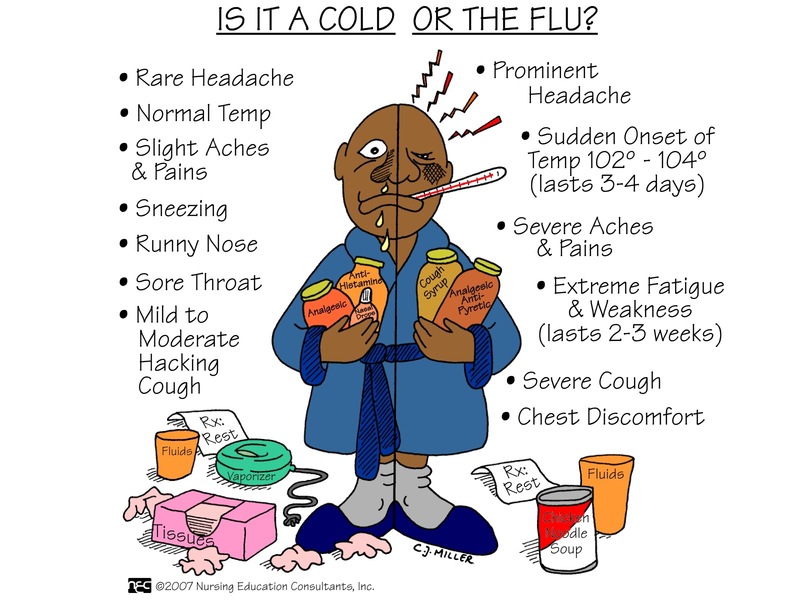 Third, you cannot get the flu from the flu vaccine because the injected form of the vaccine is dead. You might get achy and slightly feverish within 2-3 days of getting the vaccine because your body is developing antibodies to the vaccine. As it mounts this immune response, you might feel under the weather a bit. Getting the Actual Flu Symptoms 7 days later, is not from the vaccine. You got the flu because it takes the vaccine about 2 weeks to become fully effective. Thimerosal or Mercury – NONE ( in our office supply). Other offices may still have the multi dose vial containing Thimerosal of 12.5micrograms per 0.25ml. Make sure you ask your provider about this detail. Here are the Ingredient lists in the medications and fluids commonly used to treat THE FLU symptoms: Be Very Afraid!! some Gatorade flavor variations use brominated vegetable oil as a stabilizer. I welcome comments and suggestions. AND get your Flu Shot!!!! – Please see the comment section below for more details on formaldehyde and flu symptom duration concerns. Can you show me independent research (that is not sponsored by the vaccine manufacturer) that provides evidence that the vaccine shortens duration of the flu? When I look up ingredients on FDA website I see a few additional that you didn’t mention, such as mercury in the multidose formulation and formaldehyde levels can be up to 50mcg in the smallest dose. See http://www.fda.gov/downloads/BiologicsBloodVaccines/Vaccines/ApprovedProducts/UCM305089.pdf. ! So even after the flu shot, one has A 40-60% chance (sometimes higher as in the case of last years shot) of getting the flu so you’ll end up putting this additional crap in your body anyway. Hi Mary Elizabeth, thank you for your questions. The multi dose vial we have in our clinic is mercury and thimerasol free (this is the package insert used for the article). However, you are right, there are various formulations available on the market, and some do contain thimerasol (mercury). I will addend. Also, formaldehyde can be less then or equal to the 50micrograms. (will correct that, thanks for pointing that out). Here is a link to formaldehyde exposure in our environment. https://www.atsdr.cdc.gov/phs/phs.asp?id=218&tid=39 – note clothing, air, water, cosmetics, synthetic pesticides used on fruits . Yes you are correct, the flu shot was not very effective last year, as mentioned in the article, and it was only a 25% match. And yes there is a risk of getting the flu even after getting 0.5ml of the flu shot. The point of the article is that many obsess over the ingredients such as 0.5micrograms of formaldehyde in the 0.5ml shot, but give little thought to all the chemicals in pain relievers, cough reducers (which don’t work anyway), in antibiotics and steroids used to treat flu complications (many milligrams and milliliters). Lastly, my most favorite is the request for Tamiflu, which is far more toxic then the flu shot, by those who refuse the flu vaccine because of its “toxicity”.